The combined efforts of search and rescue teams from Black Canyon of the Gunnison National Park, Ouray Mountain Rescue, West Elk Mountain Rescue and Western State Mountain Rescue resulted in the successful evacuation of an injured climber from the Atlantis buttress during a spring storm on Sunday, April 13th. The park received a report of an injured climber on Saturday evening. Climbing rangers, including a park paramedic, located the climber late that evening and bivouacked overnight with him, treating his several injuries. He was injured when he pulled a large boulder off the wall while leading a pitch on a route called “Hotlanta” on the Atlantis buttress. Additional technical rescue teams arrived on Sunday to help raise the climber 1,800 feet to the canyon’s North Rim. Intermittent whiteout conditions with heavy, wet snow and gusty winds challenged the rescuers during this high angle rescue. The climber, who is from Durango, Colorado, was taken to a medical facility with ankle, chest, and facial injuries. He is in stable condition. 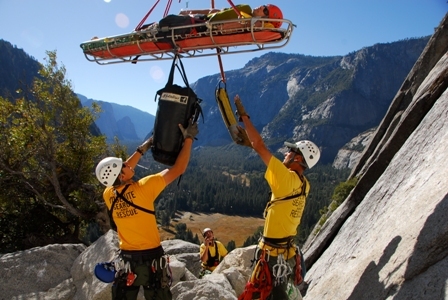 This entry was posted in Search and Rescue and tagged canyoneering, hunters, hypothermia, lost, missing, search and rescue, wilderness survival on April 20, 2014 by bigpigoutdoors. Get Manimal to take some pics dangling from the chopper and I will post them up..